If you are considering a trade in, please use the tools linked here to see the cash value of your gas savings. The gas savings can be more valuable than a Cash for Clunkers voucher. Cash for Clunkers is back thanks to Rep. Betty Sutton of Ohio. See this April 1 post for useful tables showing the gas and cost savings you would receive under the new plan; for a recap of the earlier 2009 versions, see this post. See the blog archive on the right for older and newer posts on Cash for Clunkers. As we argued in our original post on Cash for Clunkers, encouraging someone to replace a 14 MPG car with a 25 MPG car saves 300 gallons of gas per 10,000 miles of driving, or 3 tons of carbon dioxide. There is no improvement that one can make to a 33 MPG car that will reduce carbon dioxide by the same amount. 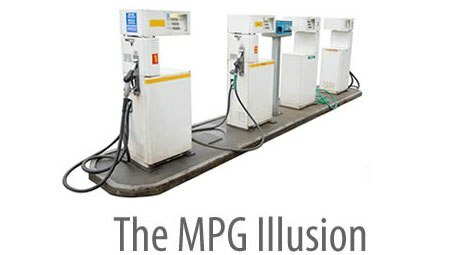 GPM makes the greenhouse gas benefits of Cash for Clunkers clear. Rep. Betty Sutton of Ohio has introduced a new bill that offers up to $5,000 towards purchasing a new, US-made car that gets 27 MPG (or 24 MPG for a truck or SUV), and up to $4,000 towards purchasing a Canadian or Mexican made car that gets 30 MPG. Cars assembled outside the US can be eligible but cars manufactured outside the US are not. The new car must cost $35,000 or less. This bill requires that the trade-in car must be at least 8 years old and must be junked. Autobloggreen reports that the payment for the new car is graduated and increases with the new cars efficiency. Details, however, are hard to come by. Whereas the original bill focused on removing the most inefficient cars (below 18 MPG, or 5.5 gallons per 100 miles) and replacing them with efficient cars (25% better MPG than the class average, around 4 gallons per 100 miles), this bill appears to allow a car buyer to turn in any 8+ year old car as long as the new car is more efficient and above the stated minimum MPG for the class. That makes more cars eligible for the trade in. It also means that some trade ins may have only a small impact on CO2 reductions (e.g., should someone trade in a 25 MPG car for a 28 MPG car). See also coverage at the Detroit Free Press and at Kicking Tires.